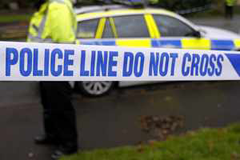 Two men died when a car crashed into roadside railings and rolled over in West Bromwich. The men were thrown from the Honda Civic during the collision, which happened in Park Lane at 22:00 BST on Wednesday. A 28-year-old man was confirmed dead at the scene while a second man, aged 23, was declared dead at hospital. Police believe both men are from the Handsworth area of Birmingham. Three ambulances and a paramedic attended. West Midlands Ambulance Service said crews arrived to find the car on its roof. A spokesman said: "The two men who were travelling in the car were both ejected from the vehicle." PC Karl Davies said: "Two men have tragically lost their lives and two families have been left shocked and grief stricken at their sudden death. "Both families will be supported by specially trained family liaison officers at this difficult time."